Thousands of attendees braved blustery rainy weather to observe the annual Vaisakhi festival found plenty of politicians eager to sell their platforms as a federal election looms, with parties keen to burnish their images in the South Asian community. Foremost among the speakers at an event at south Vancouver’s Ross Street Temple were Prime Minister Justin Trudeau and Opposition Leader Andrew Scheer, who were both welcomed and asked to speak to attendees within a pre-determined time limit. Also on hand were representatives of the other major provincial and federal parties, and Vancouver Mayor Kennedy Stewart. 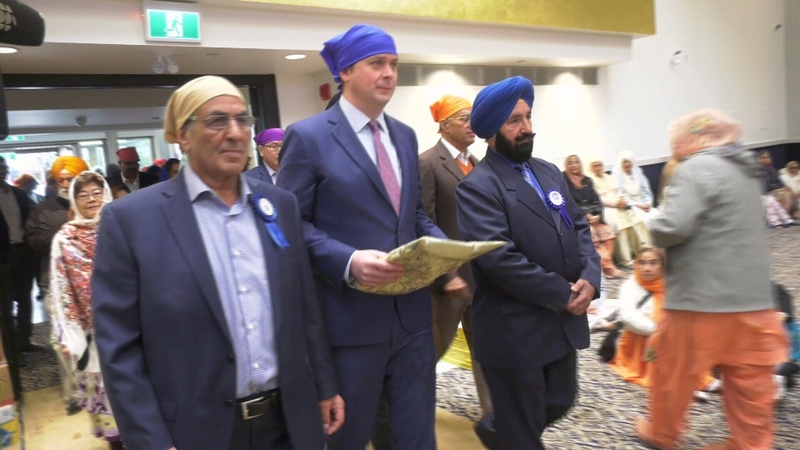 Scheer quipped he’d been “practicing all day” to recite a Sikh greeting: Waheguru Ji Ka Khalsa, Waheguru Ji Ki Fateh. He went on to remind attendees his Conservative party was the first to promote a turbaned Sikh to cabinet. “The Sikh community represents the quintessential Canadian story -- first met with injustice and hardship, you persevered and are now thriving," he said. Trudeau was warmly greeted by temple brass, who were enthusiastic to have a sitting prime minister give remarks that were focussed on the significance of the holiday and didn’t touch on Liberal policies, though he did reference the government’s apology for the Komagata Maru incident. "We are stronger as a community and as a country not in spite of our differences, but because of our differences,” he said. Trudeau also highlighted his repeated visits to Vaisakhi events and his close working relationship with Vancouver South MP Harjit Sajjan, who became the country’s first Sikh Minister of Defence under Trudeau’s leadership. The smiley photo-ops at both the temple and a speech along the parade route provided a welcome change of setting for Trudeau, facing fierce criticism and negative media coverage in the face of ongoing revelations and developments in the SNC Lavalin scandal. But his efforts to forge a positive connection with the crowd during a pause of the Vaisakhi parade at the historic Punjabi Market on Main Street were met with some frustration. The volume of the loudspeakers faded during Sajjan’s introduction and continued through Trudeau’s remarks so that only those closest to the stage could hear. Many others simply gave up trying to listen in and walked away as other event-goers walked by unaware the prime minister was making remarks on the smaller of two stages in the area. Provincial Liberal leader Andrew Wilkinson took his turn at the podium during the morning event at the temple, as did long-time Vancouver-Kingsway MP Don Davies, who spoke on behalf of absent federal NDP party leader, Jagmeet Singh. Provincial MLA Jinny Sims attended in lieu of Premier John Horgan, reading a statement on his behalf. “Vibrant community events and Khalsa Day parades honour the creation of the Khalsa and the values of inclusion, generosity, peace, equality and justice,” she read aloud of the festival combining celebrations of the spring harvest, solar new year and religious events significant to Sikhs and Hindus. “[Vaisakhi] is a celebration of human rights, compassion and the belief that everyone should be free of oppression, discrimination and prejudice regardless of your gender, race, sexuality or identity." Opposition Leader Andrew Scheer speaks at an event at Vancouver's Ross Street Temple.